A green cycle way on the Detroit Superior Bridge. Cleveland is known for the burning river, micro-brews, and great food. Detroit Superior Bridge is in the heart of these locations and has its own place in Cleveland history. 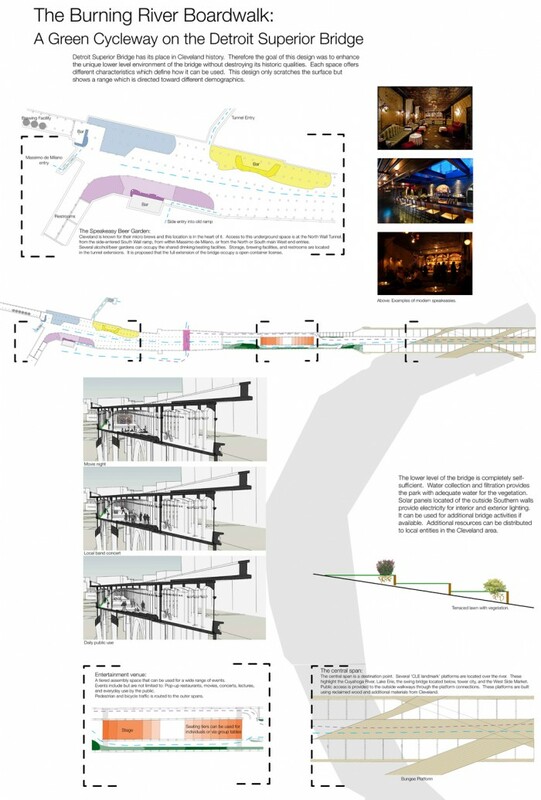 The goal of this design was to enhance the unique lower level environment of the bridge through creative use and well thought additions directed towards a wide demographic. It was accomplished without destroying or dramatically altering the bridges’ defining characteristics or historical qualities. 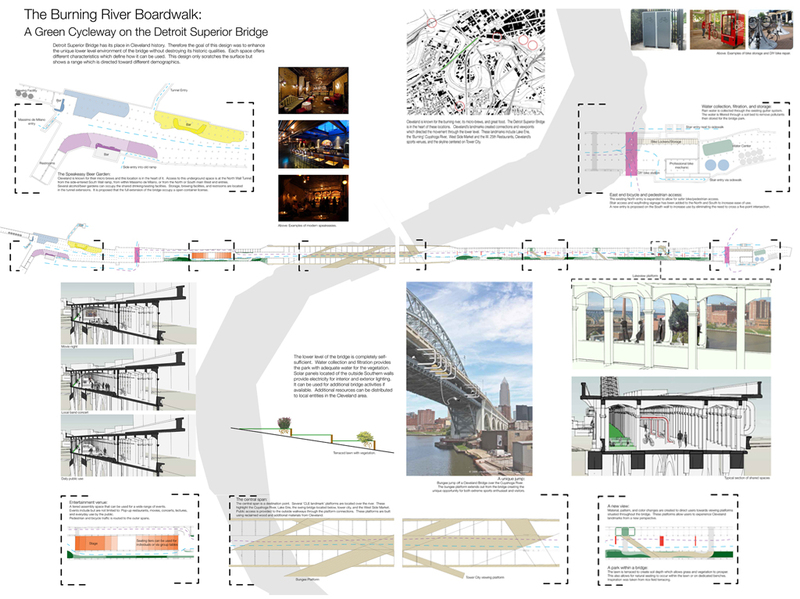 Within its repetitive structure, each section of the bridge offers characteristics which define its potential use. Bungee jumping, pop-up restaurants, movies, and concerts alter the space at an hourly rate. A modern day ‘Speakeasy & Beer Garden’ with a full bridge open container license create a unique destination connecting Ohio City, the Flats, and the Warehouse District. New bus routes, entry points, and way finding graphics allow access to multiple city landmarks. A bike shop and storage facility along with a public park within the bridge connects to the Canal Towpath trail and the Cleveland Bike route. The lower level is designed to be self-sufficient through water collection, solar energy, and reclaimed materials. 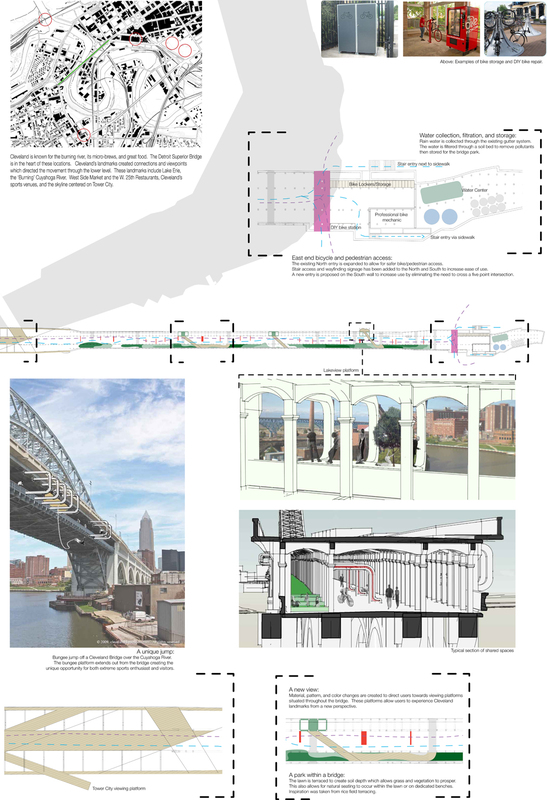 The bridge is no longer only a corridor but a destination point within Cleveland.